Dr. Shelby Cooper is a brilliant research scientist with a past steeped in secrets and lies—lies about her true identity, her family, and what happened that summer night over two decades ago. But Shelby is a survivor and now lives the life she only dreamed of with her powerful executive husband, and two adorable kids in a picturesque New England town. When her ex-lover is discovered shot to death in the trunk of her car, overwhelming evidence points to Shelby as the killer, and to the police, it’s an open-and-shut case. For the Cooper family, it’s the beginning of a terrifying nightmare where nothing is as it seems. Who is Shelby Cooper? And why does the psychopath stalking her teenage daughter Abbie insist she has done bad things? To unmask a killer and rescue his wife from a possible murder conviction, Jason Cooper must unravel the mystery of Shelby’s past. As the clock ticks, a series of shocking revelations threaten to destroy the Coopers for good. But nothing can prepare them for the mother of all deception — a truth so horrifying, it may leave them shattered forever. 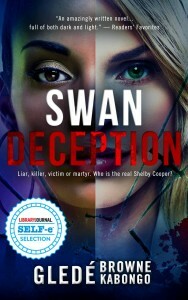 Swan Deception came from a dream, no kidding. One morning my husband wakes up, turns to me and says, “I had this dream that you should write a book called Swan”. He gave me the basic plot line and I ran with it. I had to think hard on the final twist because I knew who the real bad guy was from the beginning when he explained it. I think it worked out well. Those who’ve read the book rave about the final plot twist. Since I knew what the overall plot of the story was from the beginning, I came up with my protagonist and antagonist characters first. For Shelby Cooper my protagonist, her past had to be an integral part of the story. So I cooked up a Louisiana girl who loves cooking but faced an abusive mother on a daily basis growing up. That’s part of what drove her to become the woman you meet throughout the book. She became a successful scientist and had the family she always wanted. But her past also equipped her to battle an antagonist equally determined. Shelby is married with two children, a teenage girl, Abbie and an 11-year old boy, Miles. I made Abbie, one of the POV characters because it was important that readers get an unflinching look at how the story impacted the kids. A mother in prison for murder has life-altering implications for kids and I needed to address that. Abbie had to be as smart, resourceful and tough as her mother. Hot tears flow like lava. I’m shaking. My emotions won’t be controlled. I feel everything at once: fear, hatred, anger, despair. A knock on the driver side window startles me. It’s Officer Hannon again. I can’t catch a break today even if they were falling from the sky like locusts. His face is as hard as a three-day old bagel. I slide the automatic windows down again. This is bad. If I stay in the car, he might drag me out by force—not that it would take much effort on his part. If I do as he says, I could be in a whole heap of trouble although I have no idea why. I take my cell phone and purse as I exit the car. He doesn’t answer. Instead, chaos ensues. No less than six squad cars with blaring sirens and flashing lights roll up behind his cruiser. Officers are exiting their cars, weapons drawn. My heart is hammering in my chest. What do they think I did? Officer Hannon draws my attention to the trunk and that’s when I notice the broken taillight, and the bloodstain on the bumper. “Huh?” The stress must be getting to me because now I sound like I have the IQ of a log. Officer Hannon stands next to me, feet wide apart, arms folded. The other officers form a semicircle. Oh God, I hope that’s still true. I don’t know what nasty surprise that jerk has in store for me. I hit the remote on the key chain and pop the trunk. I send up a silent prayer. “See, there’s nothing in there,” I say. Officer Hannon and his fellow officers tell a different story. I move closer to the trunk and peek inside to see what has them looking like they just lost a comrade. Then I see it. My legs feel like they’re about to give way. I can’t control my breathing and my chest is tightening. I don’t want to have a heart attack at forty! Right there in the trunk of the car in the fetal position is Alessandro Rossi, with a gaping hole in the middle of his forehead.